“I have memories of those final weeks that haunt me"
He became famous because of a letter his wife wrote in March of 2017 and later published in the New York Times. Just over a year ago, Jason Rosenthal suffered the most intense loss he’d ever known in a very public spotlight. His wife died of ovarian cancer in their home, just days after she wrote an adoring and ironically funny ad looking for her husband’s next wife. That essay would be shared by millions, touching people from across the country and around the world. Still, what Amy Krouse Rosenthal did in her final moments had an intention – even down to the white, empty space she left at the bottom of her piece, titled “You May Want to Marry My Husband.” Space, she said, for him to begin a fresh start. The late Chicago author’s daughter has been vocal since her mother’s tragic death, sharing memories and ensuring her legacy lived on. But the “handsome” and “wonderful father” described by his wife as “an easy man to fall in love with,” had largely gone unheard from – until now. 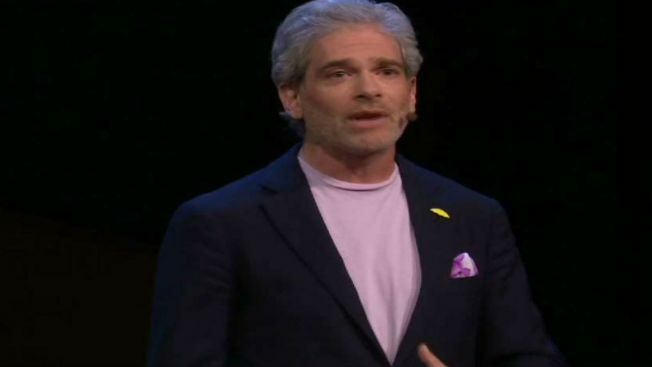 “Amy’s essay caused me to experience grief in a public way,” Jason Rosenthal said while speaking at the TED 2018 conference. Video of the talk was made public this week. Opening up about his journey after loss, Rosenthal said it was his wife’s letter that guided him through the dark cloud of grief that would ultimately consume him. Opening up about what he’s learned since the heartbreaking loss of his partner, Rosenthal began by revealing some of his tragic final moments with his wife. Amy Krouse Rosenthal died on March 13, 2017. Just a few months after his wife’s death, Rosenthal’s father died of complications related to a decades-long battle with Parkinson’s disease. It was his wife’s dying wish that her husband find love and happiness once again – and he was determined to fulfil that, but not without challenge. As for love, Rosenthal said he received his share of messages in response to his wife’s essay. One, he said, included a proposal. Among some of his advice for many who have yet to experience such loss, Rosenthal suggests talking about death openly with those in your life. And for those who are dealing with or will deal with the loss of a loved one, he had a profound message.